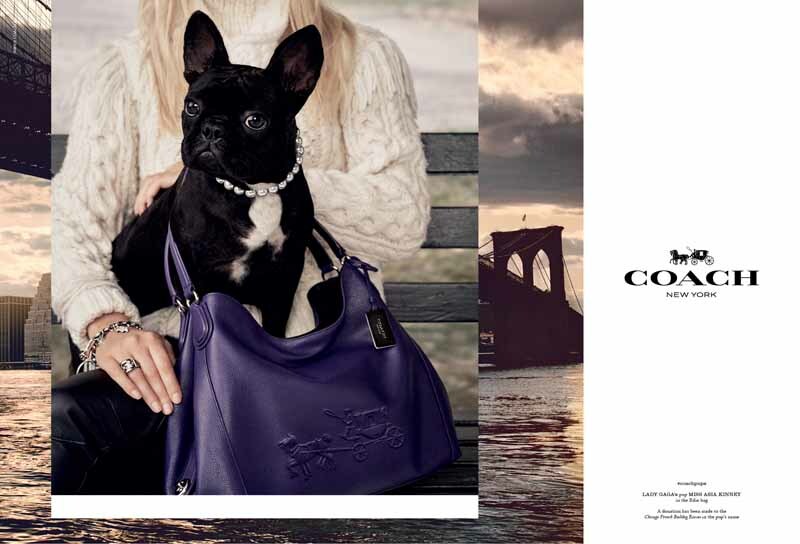 Coach has gone to the dogs with the release of its newest advertising campaign titled “COACH PUPS”. Headlined by Miss Asia Kinney, the adorable four-legged companion of Lady Gaga, the new campaign features canine stars in a series of portraits photographed by Steven Meisel. Coach’s Fall 2015 star bags. Additional PUPS staring in the campaign will be revealed shortly. Miss Asia Kinney, Lady Gaga’s now famous French Bulldog has amassed a substantial social media following in only a few short weeks. The Coach bags she elegantly models in the campaign are the Edie and the Rucksack.